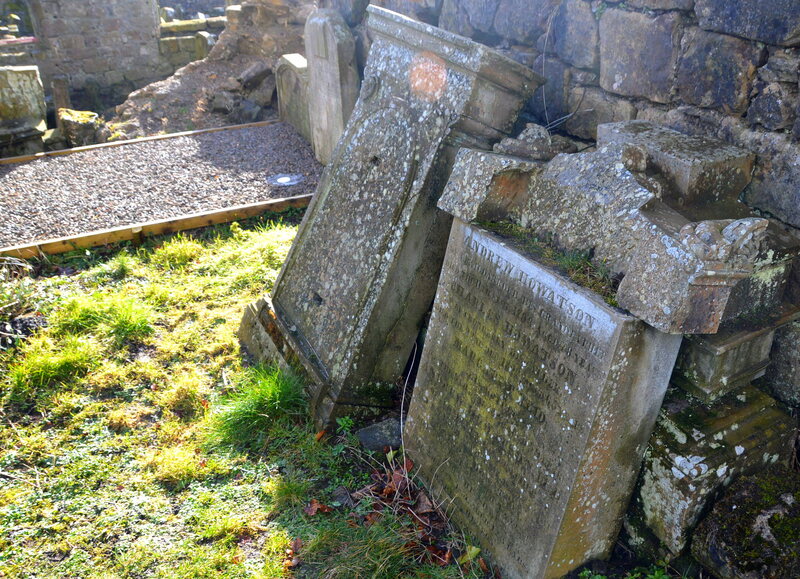 The headstone of Andrew Howatson of Craigdarroch and his family sits against the ruins of the Auld Kirk of New Cumnock in a place of note only a few yards from the lair of the Reverend Thomas Hunter, minister of the parish from 1705-1757 before he passed away three years later. The inscription on stone to the immediate left of the Howatson stone has been lost and this stone too may belong the same family. The Howatson stone is damaged and the main part of the stone covers the base now to the rear which also carries some inscription. Thankfully that was recorded by the Manpower Service Commission (MSC) team during the fantastic work they carried out in the 1970’s . 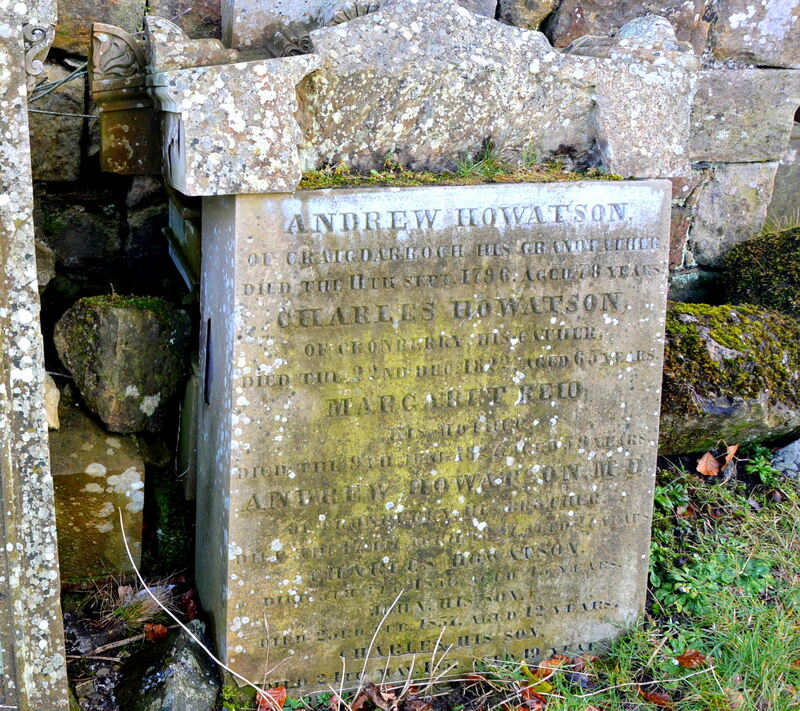 The headstone was erected by Charles Howatson in memory of his grandfather Andrew Howatson of Craigdarroch, the eldest son of Andrew Howatson and his wife Margaret Campbell of Pencloe. Altogether four of Andrew and Margaret’s children were born at Pencloe with three daughters Margaret (1710), Jean (1712) and another Jean (1715) arriving before Andrew (1719). 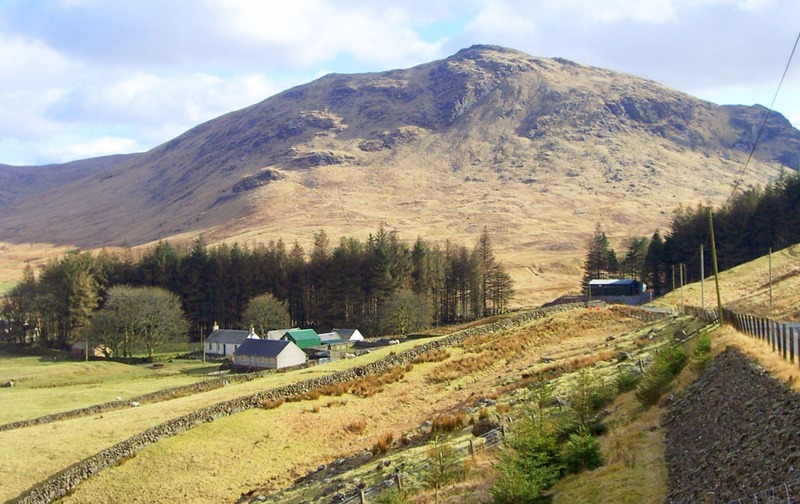 Pencloe farm is situated in Glen Afton some two miles or so from the village. In the baptismal records of the children the names appears in the form Penclove. The family moved another two miles or so up the Afton valley to live at Craigdarroch where two sets of twins Hugh & James (1723) and Helen & John (1725) were born before Ann (1729) completed the family. 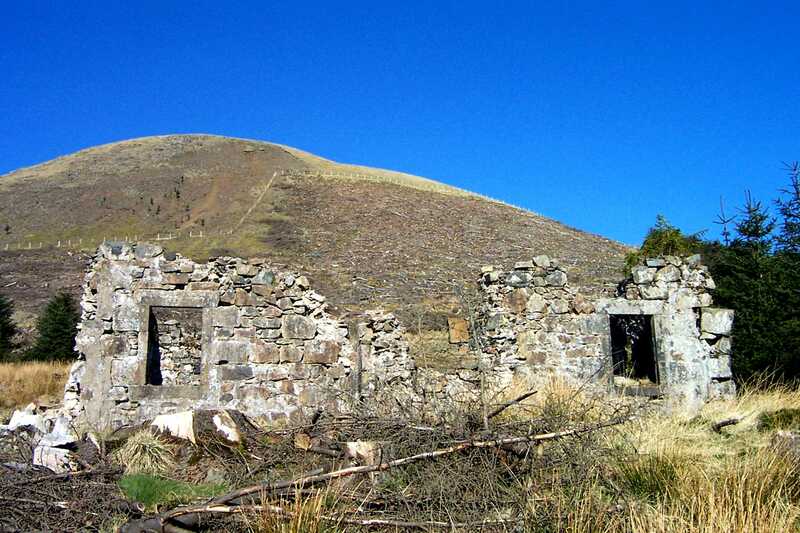 Craigdarroch farm lies in the shadow of the majestic Stayamera (or Craigbraneoch hill as it is formally known) a distinctive landmark within the parish. 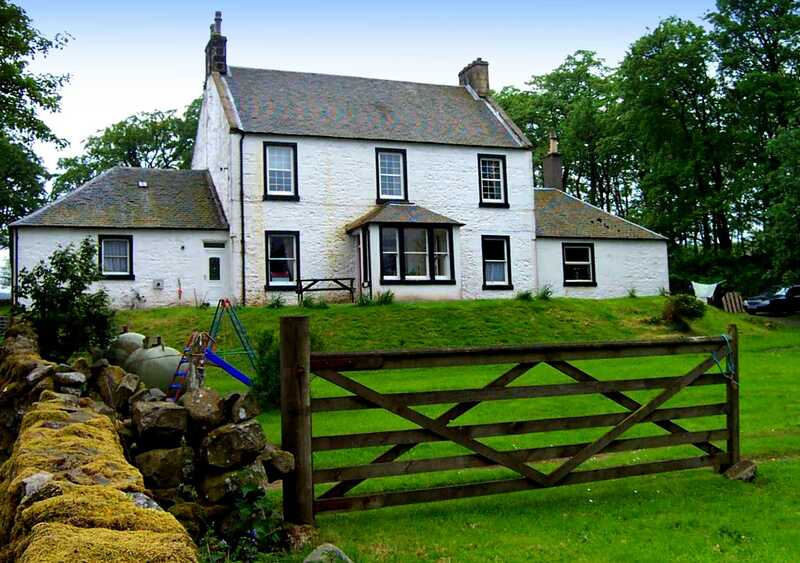 This was a prime sheep farm and the Howatson property would include the neighbouring herd’s cottage of Monthraw, further still up the Afton valley, earning it the appellation ‘The Lone Monthraw’. Unfortunately, as yet I have been unable to identify Andrew’s spouse nor can I track the births or baptisms of his children in the Old Parish Records of New Cumnock or neighbouring parishes. However, from the headstone we know he had a son Charles. Charles appears to be the first born son of Andrew Howatson and succeeded his father in Craigdarroch and Monthraw. He married Margaret Reid the eldest daughter of John Reid of Duncanziemuir and Cronberry in the parish of Auchinleck.Together they had daughters Mary (1791) and Jennet (1793) born at Craigdarroch, another daughter Margaret along with three sons Andrew (1800) , William (1808) and Charles (1813) – all born presumably in Auchinleck parish. Charles was a tenant in Cronberry, 1798 of his father-in-law John Reid  and in the same year his name appears in the Horse Tax Rolls both in Cronberry (6 horses – 3 liable for tax) and Craigdarroch (all 3 horses liable for tax – a total of six shillings). In the land tax rolls of 1803, Charles Howatson has to pay £136 13s for Craigdarroch and Monthraw, the money for the absentee proprietor paid by William McKnight in the Old Mill. 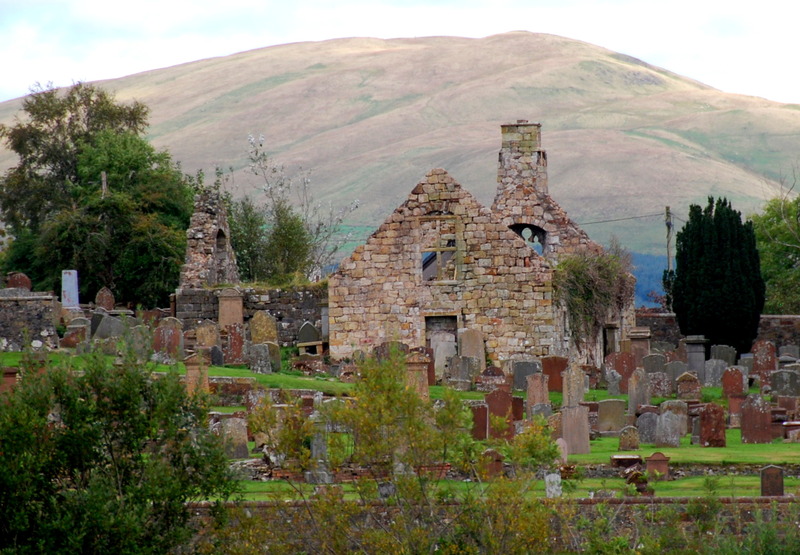 Charles Howatson died in December 1822 and his wife Margaret passed away five years later and are both buried in the Auld Kirkyard, New Cumnock. Andrew succeeded to the lands of Craigdarroch , Monthraw and Cronberry ‘burdened with heritable debts amounting to £4200 and personal debts to £2000‘ . His brother-in-law John Murdoch (husband of Margaret Howatson), a cotton yarn merchant in Paisley, took up the management of Andrew’s affairs and determined that his succession amounted to £8108 and his debts were £8008, and advised the properties be put up for sale. Murdoch then made the offer to buy the properties for £7500 and pay the creditors of 14s in the £1 of their debts, which was accepted. That John Murdoch was acting in the interest of Andrew Howatson was evident in a letter he had sent to a friend of his brother-in-law. In consequences of some observations just now made by Mr. David McKerrow*, I think proper to intimate, that the offer I made yesterday is entirely for the behoof of our mutual friend Mr Andrew Howatson, which I wish you understand; and if I hold the lands at all, it will only be until I am refunded for the (sums) I lay out. *McKerrow was the husband of Mary Howatson, sister of Murdoch’s wife Margaret. Matters took a turn for the worse when Murdoch was declared bankrupt in March 1826 and Andrew Howatson M.D. died in April of the following year, aged 27 years and his name appears on the headstone in the Auld Kirk. William the second son of Charles Howatson of Craigdarroch and Cronberry established himself as a tenant farmer at Mortommuir, Cronberry. He married Jane Samson the daughter of George Samson of Rigg, Auchinleck at Auchinleck Mill (1831) and together had 13 children. 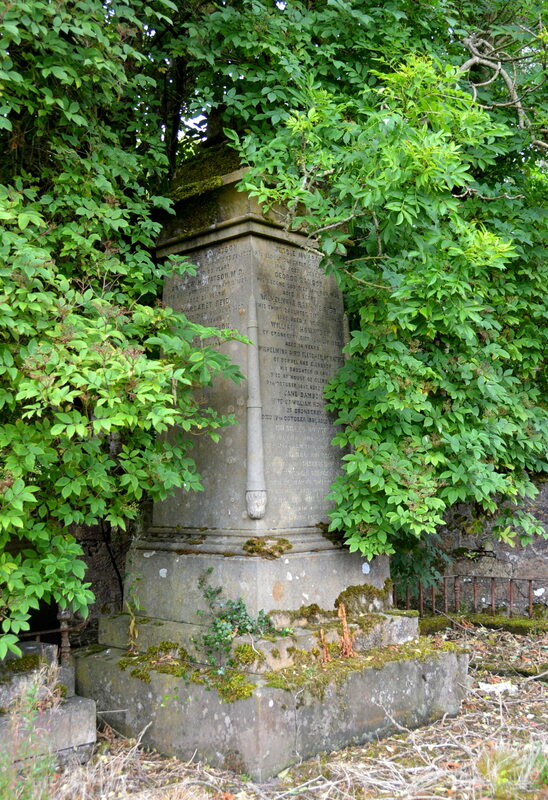 William is buried in Auchinleck Kirkyard and the grand obelisk he had erected carries the names, among others, of his father Charles, mother Margaret and brother Alexander , all of whom are named in the stone in the Auld Kirkyard of New Cumnock and are buried there. 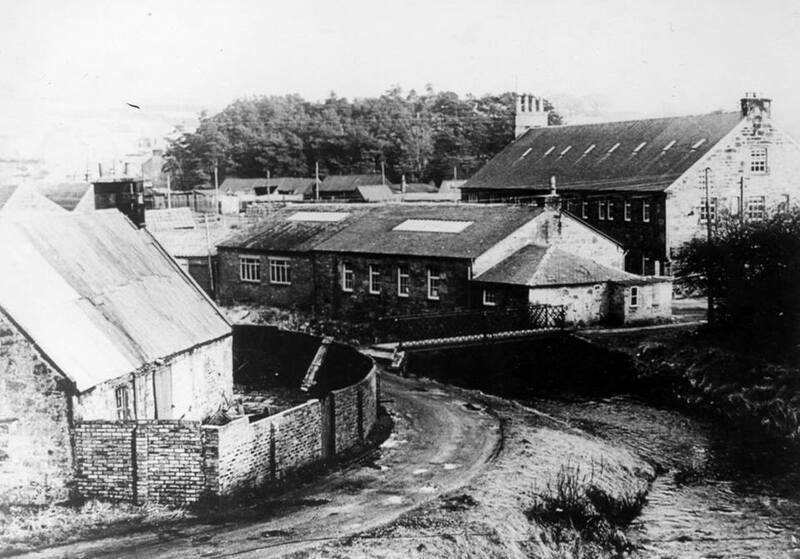 The eldest son of William Howatson worked for many years as manager of Muirkirk Ironworks . He also acquired many farms in his home parish of Auchinleck before purchasing the Glenbuck Estate in Muirkirk, where had the grand Glenbuck house built. He raised the Glenbuck flock of blackface sheep to a national reputation and won a record twelve blue ribbons in succession at the Highland and Agricultural Society. 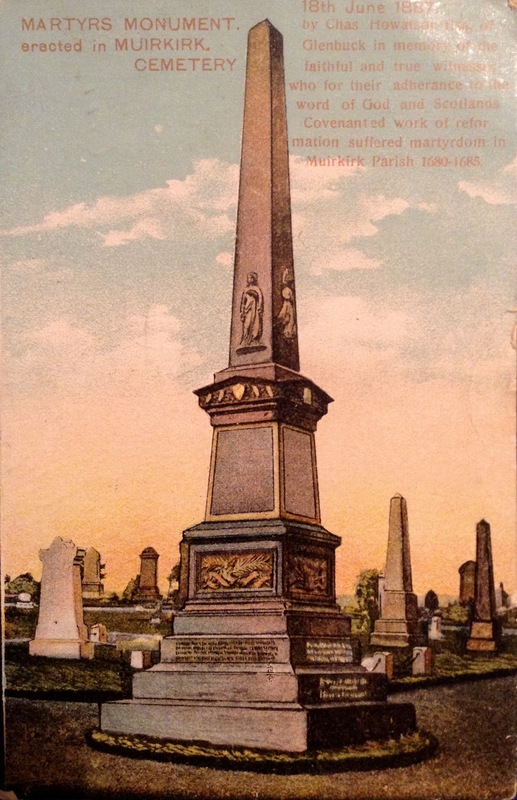 His interest in the Covenanters is shown in the magnificent memorial had erected to their memory at Muirkirk Cemetery. Charles Howatson of Glenbuck is buried in Auchinleck Kirkyard. Charles, was the third son of Charles Howatson of Craigdarroch and Cronberry. He married Margaret Currie the daughter of William Currie, farmer at Crofthead in the parish of Ochiltree and his wife Ann Train. Together they had six children, Charles (1838), William (1840), Andrew (1843), John (1845) , Margaret (1846) and James (1848). Eldest son Charles was born at Ochiltree, presumably at Crofthead farm, and baptized at Stair Church. Father Charles was working as clerk at Old Cumnock at that time and by the time the second son William was born the Howatson’s had moved to Glaisnock Cottage in Cumnock, where the rest of the family was born. Also living at the cottage was Charles’s sister, Craigdarroch born Janet. Charles had progressed from clerk to accountant working with branch of the Ayrshire Bank on the west side of Cumnock Square. His name appears as one of the Commissioners (along with that of Matthew McKerrow, bank agent in the branch of the Bank of Scotland on the south side of the Square) in the sequestration of the estates of local businessmen, including Robert Wylie, gunmaker & innkeeper in Auchinleck (Edinburgh Gazette, 10th Sept 1843). However, these were desperate times for the Howatson family, sons 12 year old John and 19 year old Charles, a banker’s clerk, both died of consumption that year; their father Charles having died the previous year, aged 43 years. All three lie together in the family lair at the kirkyard in New Cumnock. The three other sons died in the Americas – Andrew in Kingston, Jamaica; James in Berbice, British Guiana and the Honorable William Howatson in Trinidad – where he served in the Chamber of Commerce. Margaret , the only daughter, married William McGeachin who worked as an ironmoner in hos father’s business in the Square. They lived in East Elm Cottage and then later in Tower Street. Their only son, William followed in his grandfather’s footsteps and worked as a bank clerk in the Lanark branch of the Clydesdale Bank. While serving as a captain in the Highland Light Infantry he fought in the Gallipoli campaign of World War I. [Cumnock History Group,WWI Soldiers]. 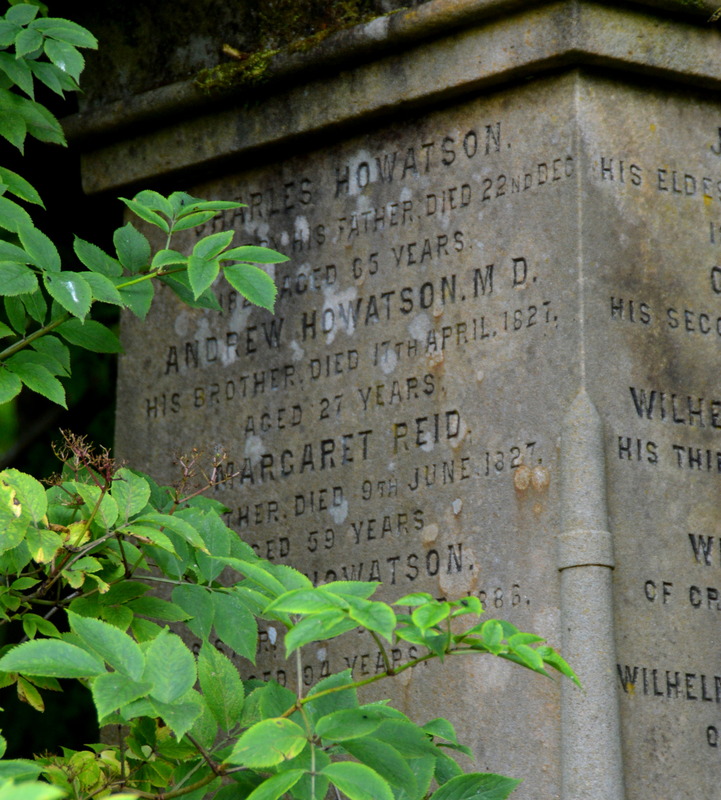 Mother, Margaret Howatson continued to live at Glaisnock Cottage, before passing away in 1894 at the grand age of 88 years before being laid to rest with her husband and sons along side the wall of the Auld Kirk of New Cumnock. This entry was posted in Uncategorized and tagged Berbice, British Guiana, Campbell, Craigdarroch, Cronberry, Cumnock, Currie, Glaisnock Cottage, Glenbuck, Howatson, Jamaica, Kingston, McGeachin, Monthraw, New Cumnock, Pencloe, Reid, Trinidad. Bookmark the permalink. To Whom It May Concern: My 3rd great-grandparent’s marriage(Samuel McElroy) in Charlotte, New Brunswick, Canada (February 1836) was witnessed by a Charles Howatsen. The family described here lists the only Charles Howatsen I can find. Could there be any connection ? I saw ships passage for later Howatsen members to New Brunswick but none quite fit possible ages. I enjoyed reading your compilation of the Howatson family, but was confused in several places about who was related to whom. I need to write it out as a tree structure. Andrew H (died 1876) married Elizabeth Paterson, and their first-born Agnes Duncan was my grandmother. She died in Brisbane in 1956. She was married to David McKerrow Paterson, the son of John Paterson who is the subject of your blog on the New Cumnock Banker. Thank you for filling in some gaps re the Howatsons… my next task is to unravel the McKerrows – do you happen to have any info on them ? I just came across your post while doing research into the Howatson family, as I just discovered my third great grandfather was Charles William Howatson, do you know if he is related to William Howatson in your post? It caught my eye because he died in Trinidad, which is where my family is from but I thought my great great grandfather was the first one to make the move to Trinidad. Let me know if you have any information related to this. George Hamilton of Boreland, second son of Sir David Hamilton of Cadyow, and Dame Janet, daughter of Keith of Galston ; but he does not quote his authority. * If the statement is correct, he must have acquired Boreland about the end of the fourteenth or beginning of the fifteenth century. Hem Hamilton of Boreland appears in the testament of Janet Wilson in Bent, lG16.John Hamilton of Boreland is mentioned in the Ayr Presbytery Records in 1650. Hugh Hamilton Laird of Boreland, on 29th June 1669, executed procuratory of resignation of his estate in favour of his granddaughter, Margaret Hamilton, only child of the deceased John Hamilton, only son of the said Hugh Hamilton. William, who succeeded, and seven other children. Anne, eldest daughter of John Hamilton of Letham, Bailie of the Abbey of Holyrood House, and Katherine Arbuckle,who subsequently married Hugh Montgomerie of Coilsfield, and was by him grandmother of Hugh, late Earl of Eglinton. The witnesses to the contract of marriage are Francis Montgomerie of Giffen, Hugh Montgomerie of Coilsfield, James’ Hamilton of Oiwestot, advocate, Robert Wallace of Holmstone, David Stewart of Physgill, Captain David Ogilvie of the Foot Guards, Alexander Montgomerie, son of Hugh Montgomerie of Boreland, and John Hamilton, brother to the said Anne Hamilton. William Montgomerie of Boreland was one of the Commissioners of Supply for Ayrshire in 1711. 1. John, of whom after. 2. William, major in the army, died unmarried in 1818. 1. Adam, merchant, Liverpool, married Grissel, daughter of James M’Adam of Waterhead, and had issue, William JtPAdam Steuart, late of Glenormiston, in Peeblesshire. 2. Susan, married to Dr. Ourrie of Liverpool. 3. Katherine, married to Robert Gladstone. 4. Sarah Montgomerie, married to James Howatson, from Lanarkshire, and had issue. 5. Margaret, married to Mr. Anderson, and had issue. 6. A daughter, married to Mr. Alexander. Had no issue. In 1751, Mr. Montgomerie, with consent of his son John, disponed the estate of Boreland to Mr. Montgomerie of Coilsfield and Mr. M’Adam of Waterhead, as trustees for their creditors, by whom it was sold to various parties. Four sons, who all died young. 5. Katherine, who died in Edinburgh, unmarried, 1881. 6. Jessie, who married James Kelton of Annan, and left issue. 1. Hamilton Anne, of whom after. 2. Margaret, married to Thomas Gairdner, W.S., second son of Captain Robert Gairdner of Mountoharles. At Air, Andrew Howatson of Craigdarroch was tried, for violently assaulting and beating James Pedine of Auchinlongford. The jury found the libel proven; but warmly recommended the pannel to favour, on account of the provocation received. The Lord Stichen ( The Lord Juftice-Clerk not being atthis court) ordained him to pay the private profecutor 42 l. Sterling in the name of damages and expenses, and foned hime in 3 l. Sterlng to the fifk ; both which fums were paid ath the bar. Hello Alastair, thank you very much for posting this interesting account of Craigdarroch .